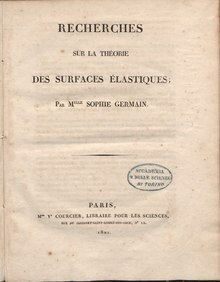 Marie-Sophie Germain (April 1, 1776 – June 27, 1831) was a French mathematician who made important contributions to differential geometry and number theory. Germain identified prime numbers. A prime number is a number that is only divisible by one and itself. She was not allowed to learn math as a child. She secretly read books that were in her father’s library, even though this was not allowed. She also stole notes from lectures at the École Polytechnique. She first sent her work to other mathematicians under a male name. She did this because she wanted a better opportunity. She also did not want to be laughed at for being female. She was inspired by reading Archimedes. She won a prize from the French Academy of Sciences. She won this because she solved an elasticity math problem. Her discoveries helped develop important buildings. She contributed to the making of the Eiffel Tower. Germain became the first women not related to a member by marriage to attend a Academies Science Meeting. The Sophie Germain prime and Crater Germain on Venus are named after her. Germain died of breast cancer on June 27, 1831 in Paris. ↑ Schiebinger, Londa. "Germain, Sophie." World Book Advanced, World Book, 2017, ezproxy.castilleja.org:2051/advanced/article?id=ar752293. Accessed 12 Apr. 2017. This page was last changed on 5 September 2018, at 19:19.